Customers trying to buy pseudoephedrine medication in Central District can expect to show ID and have their details recorded, as Police take steps to remove opportunities for methamphetamine manufacturers. Pseudoephedrine (PSE) is known to be sourced by manufacturers as an essential ingredient for the illegal drug, and as PSE is only sold as over-the-counter cold medication, pharmacies are likely targets. There are currently 71 pharmacies in Central District and police have been working with them to stamp out illegal misuse of pseudoephedrine products. Pharmacies have also been provided with information on how to both identify and deter pseudo shoppers. Detective Inspector Chris Bensemann said: "New Zealand has one of the highest user rates of methamphetamine or 'P' in the world and evidence shows us that the majority of methamphetamine and pseudoephedrine-based products are actually sourced from within this country. We are doing a lot of work to target the manufacturers and dealers, but if we can also prevent these offenders from laying their hands on the crucial ingredients in the first instance, we believe we can make a significant dent in the trade." 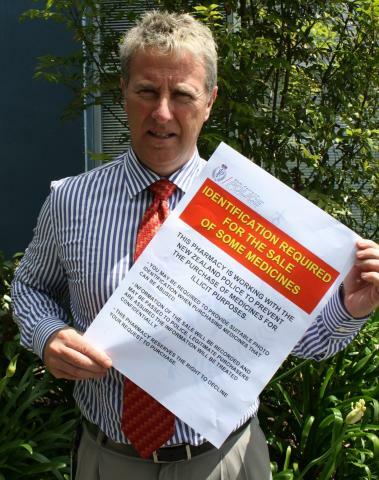 Posters have been issued to pharmacies by police to be displayed to customers. The posters make it clear that photo identification may be required and that information about their purchase will be recorded, and may be passed to the police. •	To be asked for photo identification such as a drivers licence or passport, and have those details along with information about the sale retained. Pharmacies are also being encouraged to keep in touch with one another so that they can share information if a suspicious customer is in the area. "This isn't about the legitimate local resident who genuinely needs a PSE-based treatment," says Detective Inspector Bensemann. "They have absolutely nothing to fear and pharmacy staff have sufficient experience and expertise to deal with both genuine and suspicious situations. This is about making sure they are no gaps in our armour for criminals to take advantage." As with the sale of liquor to minors, the Police may conduct random surveys of pharmacies to test whether the processes are operating effectively.